Construction has gone vertical at Project 340 in Islands of Adventure. 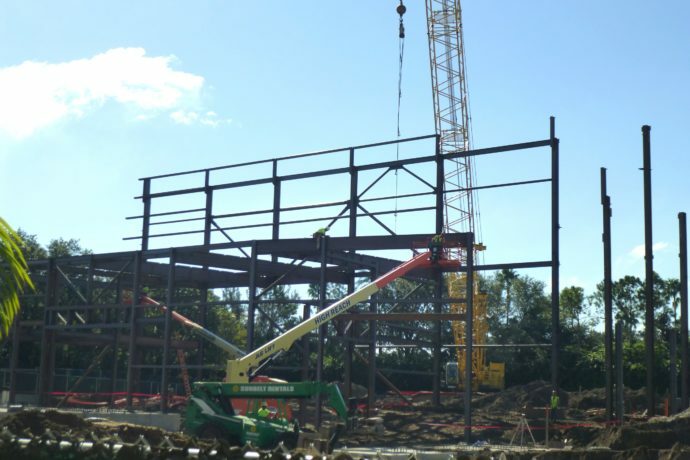 The steel structure is already several stories tall and can be seen all the way from the highway. Rumors around the web are saying when completed the facade for this attraction will reach 100 feet tall. 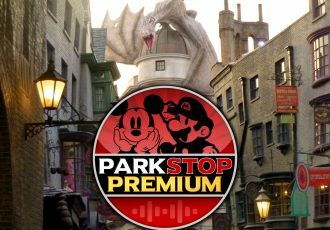 Universal is not showing any signs of slowing down with their recent additions to the parks. They’re certainly not afraid to go big when it comes to new ride technologies and hyper-themed lands. 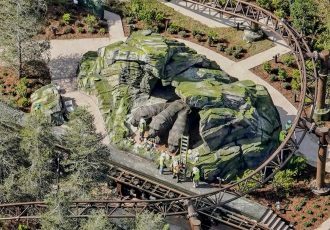 In addition to the new construction photos below, I wanted to also post some interesting news and juicy rumors about this possible King Kong attraction. 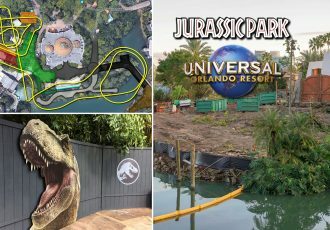 Even though the internet has been talking about this project for nearly a year now, there has still been no official word from Universal. I wouldn’t expect an official announcement from them until after Halloween Horror Nights is over, so as not to take any of its spotlight away. With the construction now rising above the walls it’s going to be harder to keep people from asking what exactly is coming. News, Rumors, and construction photos below! Wall that keeps us safe from the beasts of Skull Island. Is this what they’re building? King Kong Animated Kid’s Show on Netflix in 2016: This CG animated show will be aimed at kids and will reportedly take place in 2050 with Kong and teen sidekicks. It’s to be called Kong: King Of The Apes. 2016 Opening Date? With a movie, and now a kid’s show coming out, many believe the ride will also open some time in 2016, with many guessing Spring/Summer. 100 Foot Tall Temple Facade: hatetofly has mentioned that the exterior for this attraction will be themed to look like ancient temple ruins found on Skull Island and that the facade will reach as high as 100 feet. From the looks of construction I believe it as it is already like five stories tall and climbing. Possible Attraction Title: In one of his podcasts over at Disney Dish, Jim Hill mentioned the name being Kong: Terror of Skull Island. King Kong Animatronic Will Run: That’s according to Orlando Theme Park News. The only other animatronic figure I can think of that can do anything close to running is the Carnotaurus at Disney’s Dinosaur ride in Animal Kingdom. 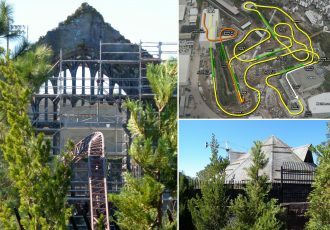 Seeing King Kong run could be something amazing if they pull it off. On the way out I noticed the Popeye statue was missing. Hope he’ll be back soon! That’s all for this update. 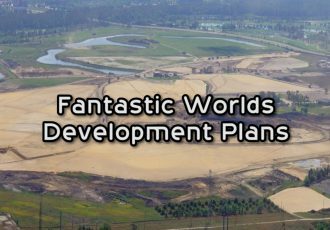 Things are really shaping up for this to be an impressive new addition to Universal Orlando. I know I’m excited.